No climbing Clements Mountain today! “So now what should we do?” we both said as we looked at one another. 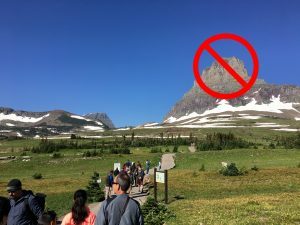 Kristen and I had arrived at Logan Pass at 9:30am on Saturday which meant that we couldn’t park in the parking lot because it was already full. After driving down to Lunch Creek to park and walking back up to the Visitor Center, we found out that the Hidden Lake trail was closed at the overlook. Bears this time of year like to snack on fish at the outlet of the lake and that is what prompted the closure of the trail. The plan had been to climb Clements Mountain, but getting to the off-trail portion of the climb meant that we had to walk just beyond the overlook. So here we were with our conundrum. After looking at the map, we decided to take the park’s free shuttle down to Siyeh Bend and climb Matahpi Peak. Last year, we climbed Going-to-the-Sun Mountain with some friends. At that time the intention was to also climb Matahpi, but a thunderstorm that was rolling in caused us to get off the mountain before we could make it a two-summit day. The shuttle dropped us off at Siyeh Bend, and we began our trek along the Piegan Pass trail on a wonderful morning. There was a cool breeze, blue skies, loads of flowers, and running water. 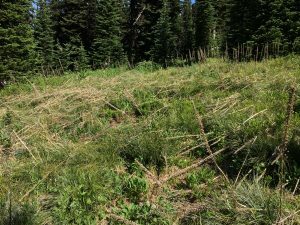 Upon reaching the avalanche chute below the two mountains that share a ridge, we went off the main trail and onto the climber’s trail. 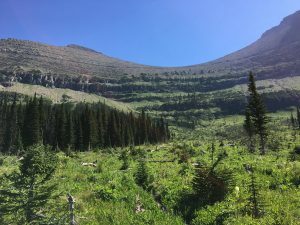 All along the way, we saw all of the old stalks from last year’s epic beargrass bloom and reminded us of the gorgeous expression of beauty these mountains deliver. As we climbed up, we came across many other flowers and the mountains across the way began to rise into view. We kept stopping to catch our breath, admire the view, and find the new mountain or pass that now was visible with our elevated position. We met another solo hiker who came in a slightly different way. Her plan was to climb Going-to-the-Sun, then Matahpi, then head back. We ran our plan by her to climb Matahpi, then potentially continue on down to Siyeh Pass and out to the road to which she said that she’d done that in the past and we should too! Once through the first set of cliff bands, then a lot of looser rock, we finally reached the saddle between Going-to-the-Sun Mountain and Matahpi Peak where we turned up for the last 800 or so feet. 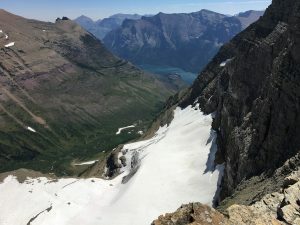 Sexton Glacier was magnificent below us and we could see the Siyeh Pass trail as it weaved its way down to St. Mary Lake. We continued up through more loose rock before coming up to the few cliff bands below the summit, then finally up to the top! What magnificent views from this summit! 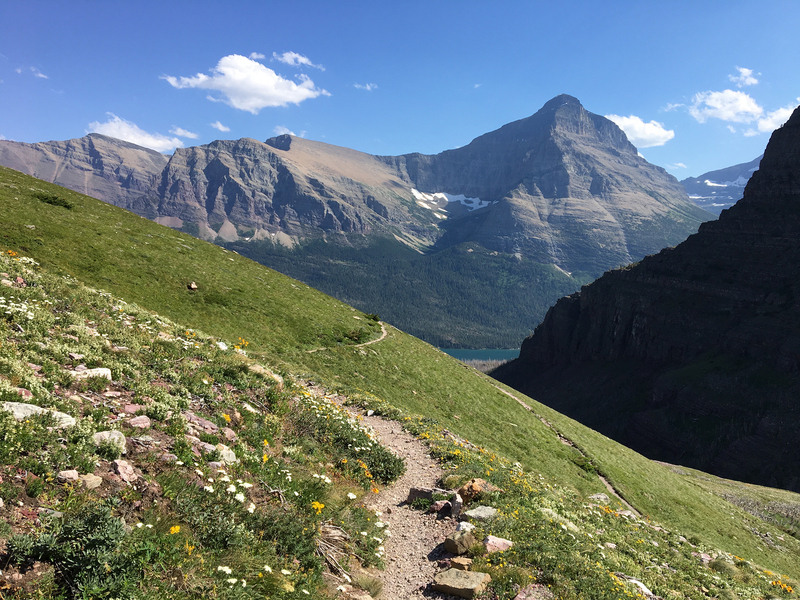 Okay, so most peaks in Glacier have magnificent views, but we loved them all the same. The wind was whipping and it was a cold wind, so we huddled out of the breeze and ate our lunch. 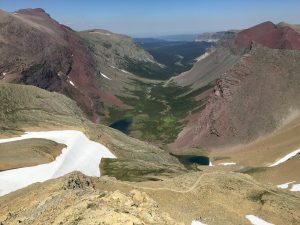 After scouting around a bit, we realized that we couldn’t continue straight down the ridgeline for the pass, but would have to climb back down through the top set of cliffs (approximately the way that we came), then skirt around to the north side of the mountain. 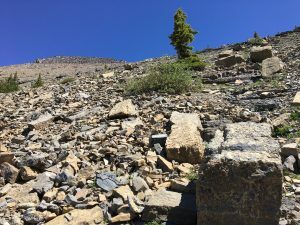 At first we found a wonderful goat trail, but that petered out and we traipsed through more loose rock. The mountain’s features angle up when walking east, so we found ourselves walking up a little, then dropping through some minor cliffs where we saw breaks, then gently angling up, and dropping down… wash, rinse, repeat. A White-tailed Ptarmigan hopped out of the way as we worked our way down. 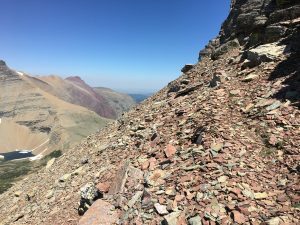 We got to a nice saddle with some more views and, after a bit more scouting, realized that we’d walk the ridge out to just above Siyeh Pass, then drop about 500ft to the trail. Once at the pass, and on the trail, we were able to cruise down through the switchbacks. Some snow was on the trail still, but all of it was easily navigable. The variety of flowers on this side of the pass are incredible and always leave me speechless or barking out exclamations at the beauty. Waterfalls dropped down into the Baring Creek drainage as we did with it. We looked up at the summit that we’d come from and marveled at how far one can travel in a day. We passed more flowers, marmots, and ground squirrels as the wind picked up. The lower we went, the harder it blew. As we dropped along Baring Creek, a gust of wind ripped my hat off which luckily landed and stayed put instead of dropping into the gorgeous creek. This section of creek is such a stunner as the water drops in pool after pool over dark, red rock. The wind was blowing up the canyon and blasting the mist back up the creek for another go at cascading over the falls. We finally went through the last of the burned trees and down to Sunrift Gorge where we met the park’s shuttle again and rode it back up to our car… tired and happy. 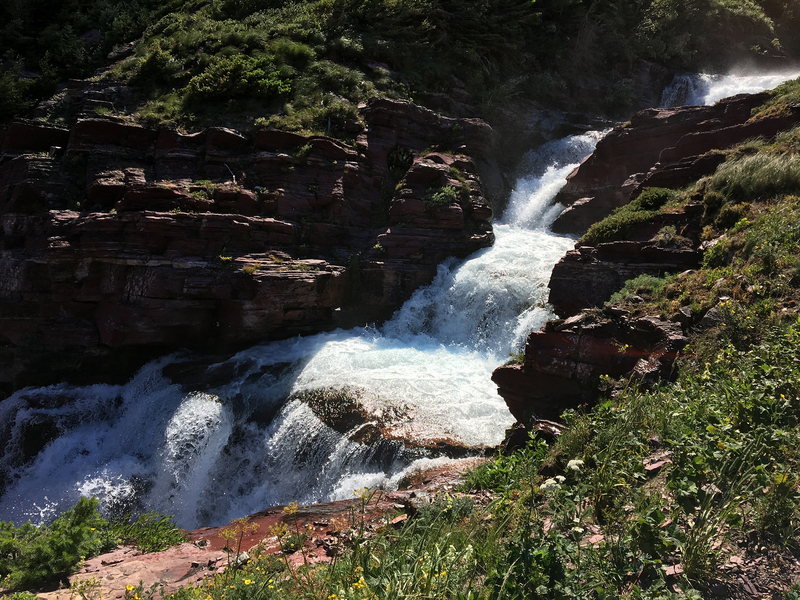 It was great to get out and exploring Glacier National Park’s high country again. Even when your first plan is foiled, there is always another happy option. What a great hike. Always love to read about y’alls adventures and appreciation of the spectacular beauty. Thanks so much for sharing! Good stuff, Jake! Love your unbridled passion for our Park!! I always enjoy your posts, Jake. 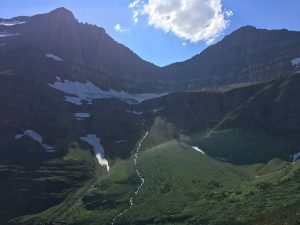 Living down south, I can’t visit Glacier nearly as often as I’d like, and you always help fill the void. I love the way the photographs presented the breathtaking scenery. It’s all beautiful and fantastic! Thumbs up!